For both her benefit and my own, I turn around to engage with the cuffed man behind me. I want to communicate with him; to ask him what he has learned, and listen hard to how he answers. I want to know what helps him through his long days and what doesn’t. I want to bless him to pray like he means it in a new and deeper way too. Instead, I reach into my purse and offer him a piece of gum. In retrospect, a totally ridiculous attempt to demonstrate that every human deserves the opportunity to know what basic kindness feels like and enjoy the taste of chemically engineered spearmint. A minute later he and his mates are called to rise for their respective appointments. My heart flutters as I realize my opportunity for genuine communication has come to a rapid end. I turn my eyes downward not wanting any of them to notice me noticing them and how loud the sounds of their shackles are clinking on the stone sound as they shuffle past. Not wanting to shame them as I and the others around me study the armed guards at each of their sides. We rise, unencumbered, to greet the woman at the reception desk. A woman in a wheelchair seated to my right smiles at me as I move freely towards the reception desk with my arm draped around my daughter’s shoulder. 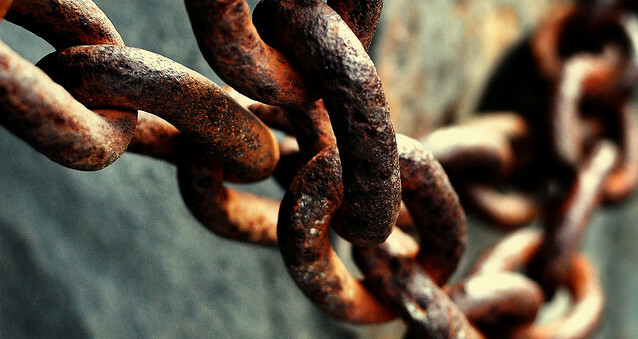 Grateful in a way that I have never been for the simple gift of standing without chains.